The above image is the result of a train exiting a tunnel, with time acceleration set to x10. 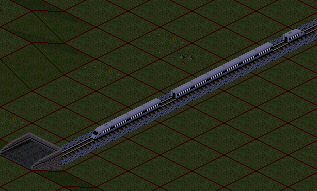 At x9, the train comes out with one carriage missing. At x8 and below, and with the Ctrl-W time acceleration, the rendering is fine. Windows 10, nightly 7805 (I'm not sure what type, the zip off the nightly site doesn't include any SDL .dll's, so assume this is the GDI version). Please check with r7942, if I correctly solved this.